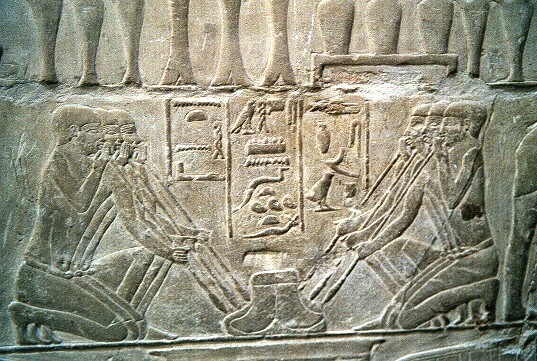 Here is a picture (a relief, actually) from a mastaba in Sakkara, the necropolis of the early (and later) pharaohs and their underlings. It is about 4500 years old and shows how to raise the temperature of a fire. It is a bit blurry, because it is dark in there and flashes are not allowed. In consequence, three out of the roughly ten words every Egyptian custodian or guardian seems to know are: "Flash no problem" - always uttered with a stretched out hand (palm up). However, being a scientist who knows what light can do to pigments over time (we are talking defects here! ), I kept my money and tried to live with highly sensitive film (another triumph of point defect and crystal engineering) and long exposure times. This picture was originally painted; but only traces of the colors are left by now. Note that blowing in the fire to raise its temperature does work - but not for large quantities of melt. Even if having plenty of slaves it not the problem, you can't get enough of them close to the fire to reall go into mass production. Serious metal industry thus had to wait for the invention of the steam engine; that is particularly true for the Bessemer process of mass steel production.